Tanjore Palace. Another view of the disused Council Chamber. bl.uk > Online Gallery Home	> Online exhibitions	> Asia, Pacific and Africa Collections	> Tanjore Palace. Another view of the disused Council Chamber. 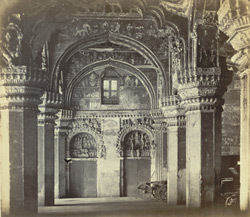 Photograph of the council chamber at Thanjavur Palace in Tamil Nadu, from the 'Photographs to Illustrate the Ancient Architecture of Southern India' collection, taken by Edmund David Lyon c. 1868. Thanjavur was established and used by the Chola rulers in the 9th-12th centuries; it later became a Nayaka stronghold in the 16th-17th centuries and was also used by the Marathas in the 18th century. The Palace at Thanjavur was built by the Nayakas in the early 17th century and was later enlarged by the Marathas. As a result, it employs a mix of Nayaka and Maratha architectural styles where the main structures are arranged around a series of courtyards with cylindrical columns and square capitals. This view is of the council chamber that dates to the Nayaka period and the elaborate frescoes and scultpure work on the walls can clearly be seen.